NASA astronauts will not be taking commercial spaceships to the International Space Station until at least 2017, agency officials announced today (Dec. 15). Facing an uncertain budget climate, NASA is changing its approach to funding the private development of astronaut-ferrying spacecraft under the space agency's Commercial Crew Development program, which could push back the start of U.S. commercial flights to and from low-Earth orbit by a year or more. 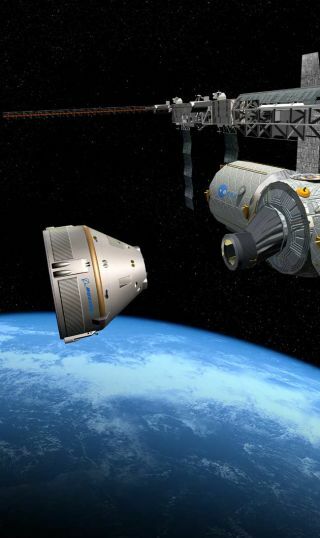 For the next phase of the CCDev program, NASA plans to use multiple, competitively awarded Space Act Agreements rather than fixed-price contracts, Bill Gerstenmaier, NASA's associate administrator for human exploration and operations, said in a news briefing. This will give the agency budget flexibility and allow it to work with more partners during this phase of the program, agency officials said. It also adds steps to the development process, making the schedule less predictable. "Ultimately our goal is to get CCDev capability to the ISS," Gerstenmaier said, referring to the space station. The Space Act Agreements will be helpful in light of "this current environment, our budget and other activities," he said. The new approach was largely due to NASA's ongoing budgetary woes, Gerstenmaier said. Since NASA is receiving less money than President Barack Obama requested for its commercial space program and budget talks are constantly fluctuating, shifting to competitive Space Act Agreements was a logical and necessary step, he said. "If we look at where we were in the contracts in a fairly stable budget environment, with clear understanding of what the budget will be, a contract is very effective," Gerstenmaier said. "But in a very dynamic budget environment, it makes it very tough to deal. Firm fixed-price contracts — if you don't get the funds, it makes it very difficult to renegotiate the contract." This artist's illustration of the orbital crew-carrying spaceship planned by the private company Blue Origin was included in the firm's NASA Space Act agreement to continue its work on a commercial crew space vehicle. By adjusting the way funds are awarded for milestones and technical achievements, NASA will be able to stay on track in its goal to have American-built spacecraft carry astronauts to and from the space station, agency officials said. Since the retirement of NASA's space shuttle fleet, the space agency has been buying rides on Russian spacecraft for its astronauts. "NASA is committed to ensuring that U.S. companies are sending American astronauts into space," NASA Administrator Charles Bolden said in a statement. "This new acquisition strategy will allow us to preserve competition as we maintain our momentum to provide a U.S.-based commercial crew launch capability at the earliest possible time." While Space Act Agreements give NASA more flexibility with funding and milestones, they also give the agency less technical control over the spacecraft designs. Instead, the commercial companies are granted more freedom for creativity and innovation within NASA's stated requirements. "Space Acts don't allow us to get as involved technically with the teams; we can't actually approve their designs," Gerstenmaier said. "We have our requirements out there. They know what we're looking for. We have a very good set of requirements." Furthermore, "the competition will help mitigate that technical risk that comes out the other side," he added. NASA's CCDev efforts are a crucial part of the agency's transition to commercial services following the retirement of the space shuttle program in July. With these new modifications in place, NASA is hoping to fly commercial vehicles to the orbiting complex in 2017. That timeline ultimately will be dictated, however, by the readiness and safety of the vehicles. COTS 2 Demo Dragon undergoing launch prep at SpaceX hangar in Cape Canaveral. In April, four private companies split $269.3 million under the second round of the CCDev program. The Boeing Co. of Houston; Space Exploration Technologies (SpaceX) of Hawthorne, Calif.; Sierra Nevada Corp. of Louisville, Colo.; and Blue Origin of Kent, Wash., were selected to refine the concepts, designs and development of their spacecraft and launch vehicle proposals. "Given budget realities, NASA and domestic space companies need to innovate more than ever," SpaceX president Gwynne Shotwell said in a statement. "Space Act Agreements yield amazing results — we need only look at the Dragon spacecraft and Falcon 9 rocket, both highly advanced, all-American vehicles designed using 21st-century technology. We applaud NASA's decision to use Space Act Agreements for the next round of commercial crew and look forward to the competition." The adjustments announced today will be separate from the work being carried out under existing Space Act Agreements, agency officials said. The new competition will focus on the overall design of the system, rather than single technological activities and milestones. More details of the new competition will be available in January, officials added. Once the competitive Space Act Agreements are awarded, they will be followed by contracts for the certification phase, which will ensure that the vehicles meet the safety and performance requirements set out by the agency.